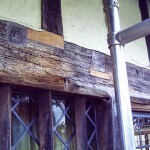 The oak frame of this Grade II listed property in the hamlet of Great Barwick, Hertfordshire needed low disturbance repairs to preserve the heritage and structure of the building. 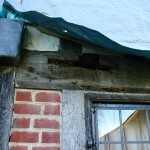 Water ingress into the bessemer beam supporting the front elevation had contributed to decay, resulting in the lower edge of the beam’s structural integrity being compromised. 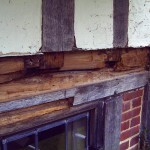 The decayed timber was removed by cutting regular shaped sections of timber from the beam. 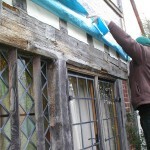 The amount of timber removed was sufficient to get to sound solid wood to keep the amount of wood being removed to a minimum. New species matched oak of a similar moisture content was then cut to size and bonded in place with Rotafix Structural Adhesive (RSA) as it is an ideal choice for this application as it has a long open time and a slow cure. As the glue line for the Rotafix Structural is a thickly applied 2-4mm this filled any irregularity between the surfaces. The slow setting nature of the adhesive allowed the manipulation and movement of the replacement timber pieces without the adhesive curing prematurely. Rotafix Structural Adhesive was injected into accessible areas to ensure that voids were completely filled to prevent further decay. The thixotropic consistency of the adhesive allows it to be be pumped vertically without slump. The low shrinkage and flexible nature of the cure adhesive makes it ideal for filling voids. Matching the species and moisture content of the timber is important as it will then expand and contract at the same rate as the existing timber. The replacement timber pieces will be shaped and stained to blend in with the existing timber in due course. For further information about the Resiwood system of repair, using RSA Structural Adhesive or obtaining species matched replacement timber pieces manufactured to meet your requirements please contact us on +44 (0)1639 730481 where one of our technical team will be happy to assist.